It’s that time of year…the end of the growing season. So you have a planter, stoop pot or window boxes that aren’t looking so great and you’re wondering what to do to spruce them up… Well, here’s a quick fix! 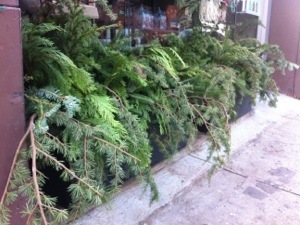 Head out and pick up a few bundles of mixed evergreens. Noble fir, hemlock, cedar, white pine are all great choices and generally available at your local garden center/floral shop. Look for interesting textures and a variety of tones when selecting your greens. First: clean up the planters/window boxes cutting all of the existing plantings at the soil line leaving the root system in place. Next: arrange the cut evergreens in the window box starting with the hardiest stems first,such as noble fir, and go from there. Insert the cut evergreen branches into the soil. The root systems left from the plants will hold the cut greens in place and the drop in temperature throughout the season will preserve them with nature acting as a giant refrigerator. Last: get creative! Insert berry branches amongst the greens for a little color and texture ( & food for the birds!) ilex, rose hips, juniper and other seasonal branches work well for this. You can take it even further adding pinecones or any other natural pods and elements you can find. You did it! Now hang tight until March when early spring pansies arrive.